I have discovered a truth about quilting with linen. Here is a photo of strips I've cut out of Robert Kaufman's Essex linen/cotton blend. As you can see, there are some very nice, clean strips on the left, stacked and unstacked, which sew up very obediently. On the right, there are two very shaggy, naughty looking strips, which do not behave on the sewing machine any better than they do sitting there for the photo. They are stretchy, noodly, messy things. The difference? STARCH. 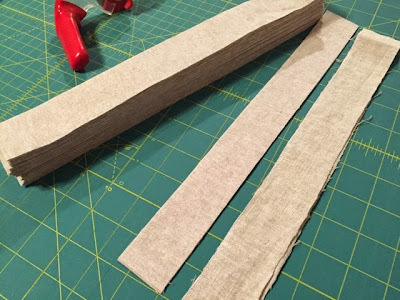 There are some quilters who insist on starching their fabrics once, twice, multiple times in order to end up with a fabric that acts more like cardboard than cloth. It makes for clean lines, but I've never, up until now, felt it was worth the bother. Linen is special. It's a wonderful, supple, tactile treat, but it does not piece easily unless you tell it who's boss. Starch accomplishes that feat, and I am a convert. I'll wash the starch out as soon as I get this thing quilted, and after that, I expect a wonderful quilt with drape that is more dependent on the batting and quilting choices I make than the fabric choices. I'll let you know when I get there. I previously blogged that this Day Break quilt is a big project, but I think that was a bit of an understatement. It's HUGE. I've ordered a design wall that can be constructed in my sewing room and broken down when I'm done using it. It's 72"x72" and still won't accommodate this monster. I might even have to quilt this quilt in two pieces. Don't ask me how I'm going to do that. Or frame the whole thing, quilt all but the edges, (there's a dead space at the edges of the frame into which the machine can't reach,) and then finish on a domestic machine. I'll let you know how I pull this off.